Jeep is a brand of American automobiles that is currently a marque of Chrysler Group LLC, a multinational manufacturer in a global strategic alliance with Fiat. [ The former Chrysler Corporation acquired the Jeep brand, along with the remaining assets of its owner American Motors, in 1987. Jeep's line of vehicles consists solely of sport utility vehicles and off-road vehicles but has also included pickup trucks in the past. The first Willys MB Jeeps were produced in 1941 with the first civilian models in 1945, making it the oldest off-road vehicle and sport utility vehicle (SUV) brand. It inspired a number of other light utility vehicles, such as the Land Rover which is the second oldest 4-wheel-drive brand. The original Jeep vehicle that first appeared as the prototype Bantam BRC became the primary light 4-wheel-drive vehicle of the United States Army and Allies during World War II, as well as the postwar period. Many Jeep variants serving similar military and civilian roles have since been created in other nations. Thanks to a seeming plethora of Jeep kits from the usual armor kit makers, it almost seems like 2013 has been the year of the Jeep. Of course, none of these companies call them Jeeps to avoid paying licensing fees, which is fine for most modelers as the Jeep is instantly recognizable as such by the majority of the world. This is an SAS version which means missing grille slats, has additional armament and armored windscreens. Unlike previous boxings, this kit does not come with two different styles of tires/wheels; only the already molded tire and outer wheel using an insert for the back side of the wheel. Perhaps that is why this boxing is a few dollars less expensive. The kit has a full body and a complete chassis. The various suspension bits are added to the chassis along with the exhaust. This is not a curbside and you get a complete four cylinder engine along with radiator and additional coolant tank. Seats are nicely done with separate frames on which the canvas seat and back are installed. Unlike the previous SAS Jeep issues, you do not get a ton of jerry cans nor do you get the sand ramps. You do get a bracket for the back for fuel cans in its place. Note that the etched set really is brass, I just had my scanner stuck on 'greyscale'. It is getting old, like your editor! You also get no fewer than four Vickers machine guns; two on single mounts and one on a double mount. One thing for sure, the finished model will be well loaded down. For figures, you do not get a driver with this one, but instead you are provided with a sprue of SAS figures from 1944 that was undoubtedly at one time a stand alone set. Instructions are well done with the usual Model Master and Gunze paint references. 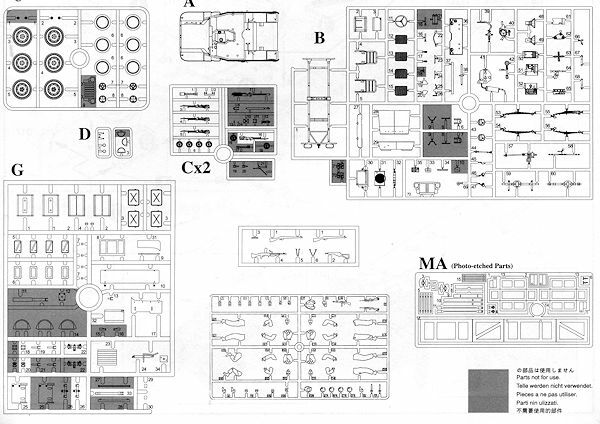 The decal sheet is a rather generic one that includes instruments for the dash and a selection of individual numbers so you can portray your own vehicle. All of the options are for unidentified units in northwest Europe during 1945 with two of them having green splotches over the OD paint scheme.nd the other has no splotches. 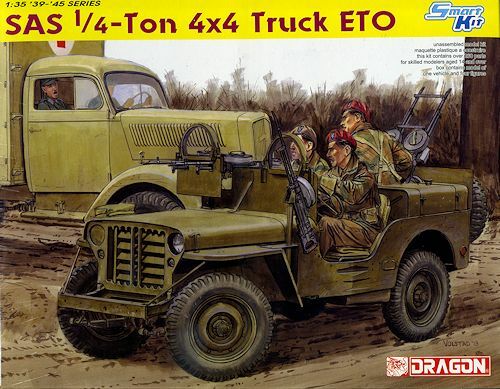 Another interesting Jeep kit for the 1/35 builder and if you are building a collection, you can have quite a few different looking vehicles.